Securely erase a SATA HDD/SSD without a host device, or dock your drive for easy access. Make the most of your SATA drives. This standalone eraser dock lets you erase your 2.5" and 3.5" solid-state drives or hard drives without connecting to a host computer, making it easy to re-use or re-purpose your SATA drive. For added peace of mind, the dock offers a printed confirmation when data has been securely erased.The eraser dock also gives you a single-bay dock for your SATA drive with fast USB 3.0 performance, also known as USB 3.1 Gen 1 (5 Gbps).Using industry-recognized erase modes, you can rest assured that the standalone eraser securely cleans, erases or sanitizes the data from your 2.5" or 3.5" SSD or HDD.The eraser dock supports nine erase modes including Quick Erase, Single and Multi-pass Overwrites, Custom Erase, Secure Erase and Enhanced Secure Erase. The Multi-pass Overwrite (3-Pass Full Disk Overwrite) erase procedures meet the requirements of DoD (5220.22-M) standards.The eraser dock lets you connect to an RS232 serial printer to print a record of the erase procedure and confirm that the erase has been successfully completed. This feature is ideal for IT technicians, system administrators or any departments needing confirmation when erasing sensitive or confidential information. For your reference, the printed receipt clearly shows you the time and date of erase, as well as the erase mode used.For IT technicians or business professionals who need to check files or test different hard drives, the dock lets you hot-swap drives in and out as needed. The dock features a single SATA bay with a top-loading design for easy access to your drives, which makes it easy to quickly back-up or transfer data to a hard drive or solid-state drive.With support for SATA I and II and large capacity drives (tested up to 6TB), this docking station is compatible with virtually any 2.5" and 3.5" SATA SSD or HDD drive.The eraser dock also works with 2.5" and 3.5" IDE hard drives, mSATA drives and M.2 drives using a compatible StarTech.com adapter:IDE hard drives: Use StarTech.com adapter SAT2IDEADP SATA to 2.5in or 3.5in IDE Hard Drive Adapter for HDD Docks.mSATA drives: Use StarTech.com adapter SAT32MSAT257 mSATA SSD to 2.5in SATA Adapter Converter.M.2 drives: Use StarTech.com adapter SAT32M225 M.2 NGFF SSD to 2.5in SATA Adapter Converter.The eraser dock is OS independent, which ensures a quick and easy setup. Its compact design and small footprint allows it to tuck easily into your workspace. 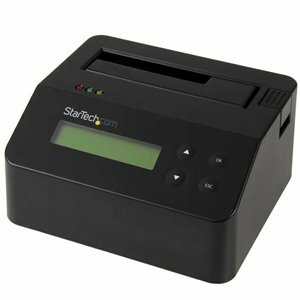 Using industry-recognized erase modes, you can rest assured that the standalone eraser securely cleans, erases or sanitizes the data from your 2.5” or 3.5” SSD or HDD.The eraser dock supports nine erase modes including: Quick Erase, Single and Multi-pass Overwrites, Custom Erase, Secure Erase and Enhanced Secure Erase. The Multi-pass Overwrite (3-Pass Full Disk Overwrite) erase procedures meet the requirements of DoD (5220.22-M) standards. For IT technicians or business professionals who need to check files or test different hard drives, the dock lets you hot-swap drives in and out as needed. The dock features a single SATA bay with a top-loading design for easy drive access, which makes it easy to quickly back-up or transfer data to a hard drive or solid-state drive.